September 1805, Portsmouth Harbour, H.M.S. Victory is undergoing a refit in preparation for her rendez-vous with history on October 5th that same year. with guns run out. When the all clear is given, normal ship’s routine can begin. I bought the Sergal Kit of Victory in March 1976, with the intention of building it out of the box. However, upon opening the box the first thing I discovered was an instruction booklet that was so poorly translated into English from Italian that it was almost unreadable. A very ominous sign of things to come. Reviewing the plans I soon realized, even at this novice stage, that the information provided was totally inadequate. Luckily I had noticed at the Hobby Shop that there was a copy of the book “The Anatomy of Nelson’s Ships” by Nepean Longridge. When I opened the book, to my amazement, I found myself in information overload. I threw out the kit plans and decided then and there that the first thing I would require would be a good nautical dictionary. And so began what I can only describe as my long 25 year journey from diorama modeling 101 to PHD (self awarded, of course!). I took some preliminary measurements from Longridge’s plans and decided that the plywood bulkheads, etc., would join the booklet and plans in the local dumpster. I made my own in 1/72 scale. After much cutting, fitting and shaping of the basic structure, I was at the planking stage. It was around this time that I decided to keep an hour-by-hour, day-by-day, year-by-year, decade-by-decade, logbook of the building process. I used the kit supplied basswood strips for the first layer of planking from the waterline to the keel. I then took two part epoxy glue and fiberglass cloth and coated the interior of the hull about ¼” thick. Two purposes were served here, one to add strength and weight to the hull and second to provide an excellent base for the copper nails and bamboo dowels yet to come. I continued the planking now above the waterline, deck by deck, coating the interior with two-part epoxy mix. The first layer of planking finished, I now measured off the gun port openings and started cutting in. 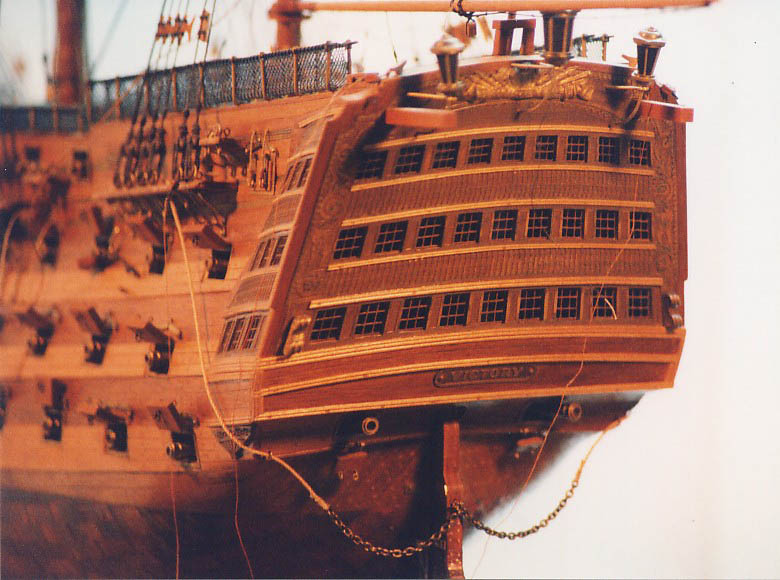 It was during this planking process that I noted an important fact in this ship’s design. 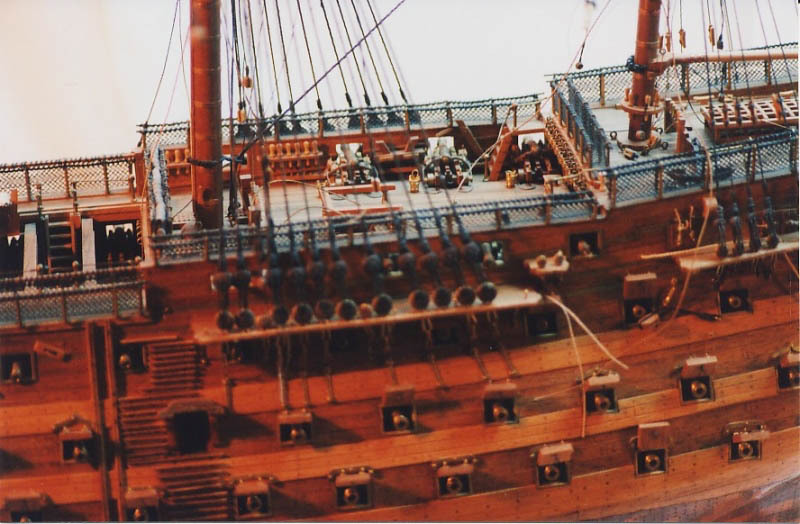 The decklines intersect the hull’s shear line and the gun ports actually cut through the wales at many points on the hull. I presume that this was the shipwright sacrificing strength for beauty. 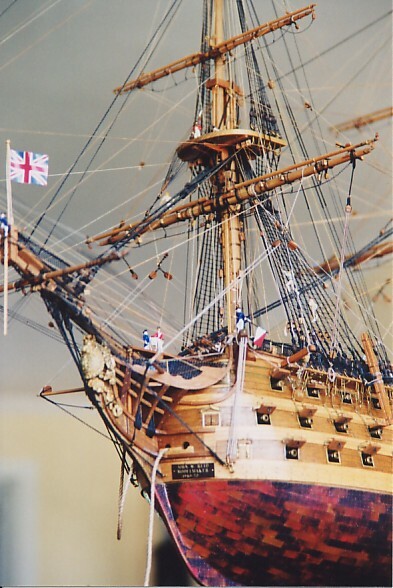 Unfortunately, the real ship was then painted “Nelson fashion” parallel with the waterline (Go figure!). With the gun ports cut in, the model was now ready for the second layer of planking using walnut strips, both glued and doweled (trunneled) to the basswood hull. It was at this point that I made a novice mistake by deciding not to use anchor stock planking for the wales. I guess I was still in rush mode (as though a few extra hours would make any difference) and decided to use fine-grained oak strips for the wales. The contrast in woods is nice but to my everlasting regret, why is it not anchor stock? Oh well, live and learn, as they say. Much has been written about copper sheathing so I won’t repeat it here. However, where I am a little different from the norm is the weathering and fastening of the individual copper plates. To weather the plates I took a butane lighter and heated them red-hot and immediately quenched them in cold water, which crazed the surface into many different shades of copper colour. I then glued them on, and here is the fun part, I made each nail out of number 22 gauge copper wire. I cut the wire to length about ¼” and sanded off each end. I then drilled 15 holes in each place through the two layers of planking into the epoxy beneath. Now it’s January 1979, and I’m almost 1100 hours into the project. I next tackled the head, waist, quarter and stern galleries. It is now September 1980, 2500 hours, and I am just starting to work the channels and their deadeye fittings. The bowsprit and masts were now stepped and their yards and fittings made up. Most of the blocks and rigging tackle are made of hard cherry wood. 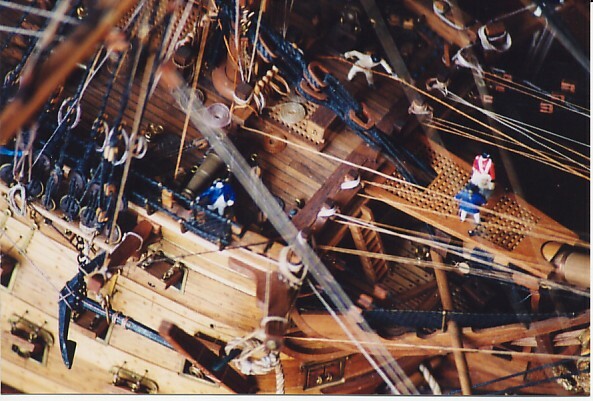 The masts are select walnut and the yards English fine grained oak (A little bow to history). 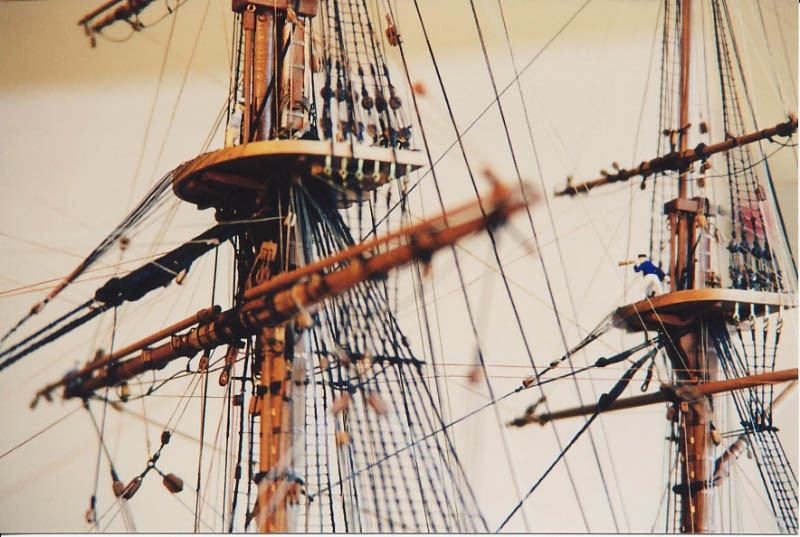 The standing and running rigging is linen line in a variety of diameters. Most of it I spun on my homemade rope walk, which I made from old mechano parts. The scale rope was then wormed, parceled and served as required. All the ratlines were hand knotted unto the shrouds. (Just ask me if I know how to do a clove hitch). 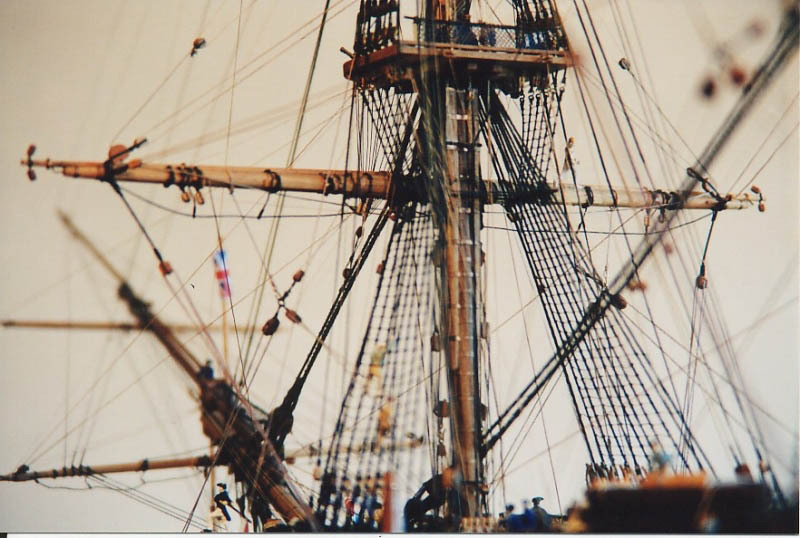 While Longridge’s book is very good, the information on how he rigged his ship is confusing. Therefore, for the rigging sequence I used a great little book that I picked up in 1977 for two dollars. I don’t know if it is still available, but this little gem is called “H.M.S. Victory” by Noel Hackney. It contains a very detailed description of how to rig a plastic airfix model with over 200 steps from flying to jib boom to rudder pendants. There is even a step-by-step sail rig for those so inclined. 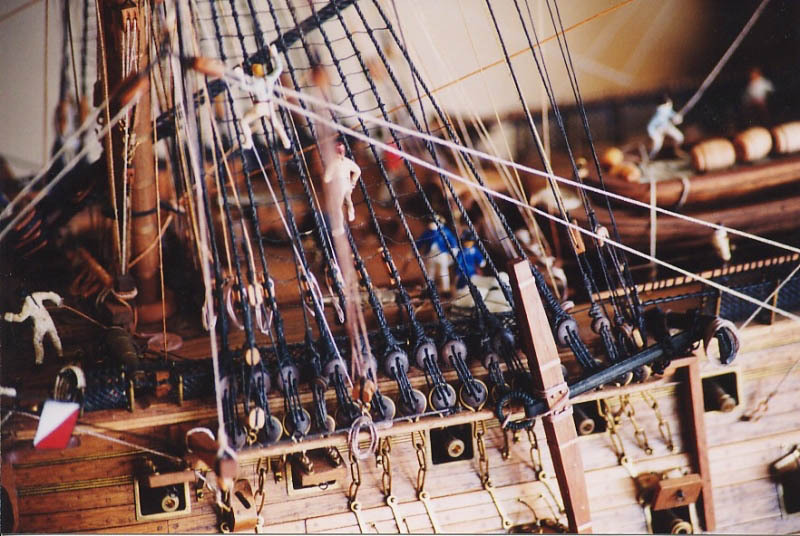 Rigging was completed May 2000, 5300 hours. I used the Sergal fittings wherever I could and scratch built what I had to if the parts were missing or too far out of scale. Unfortunately, this meant a lot of scratch building. I call my model 90% scratch built because, from a purely time point of view, that was the percentage of the total time that was involved in scratch building. The acid etched transom and quarter galleries were highly modified. 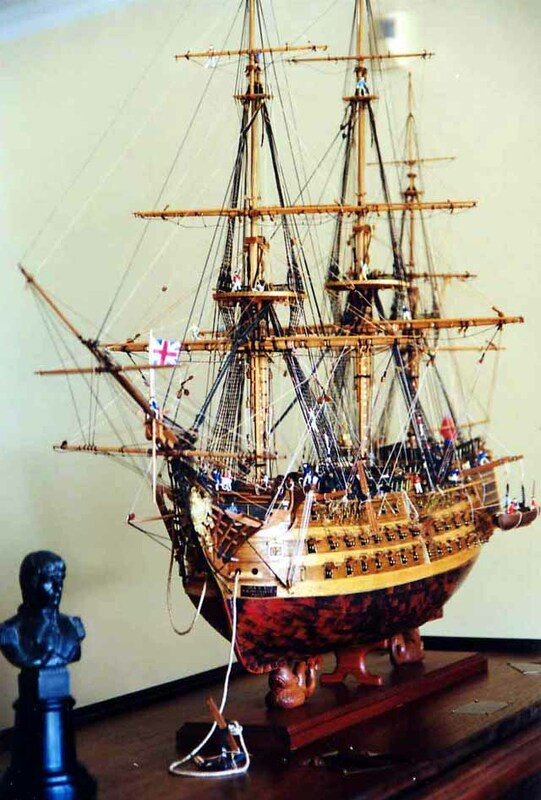 Only the figurehead was used as is although I did spray paint it gold. 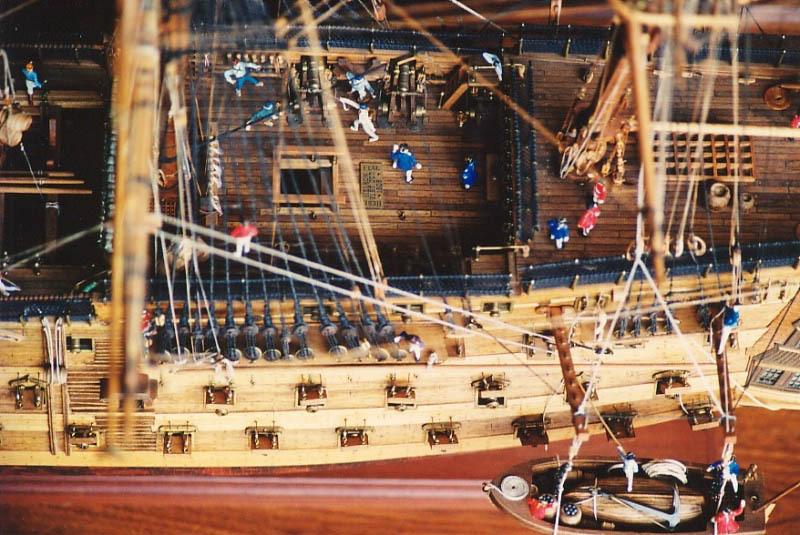 The Royal Navy officers, sailors and marines are in 1/72 scale. The figures were purchased and then converted from infantry to marine by simply cutting off unwanted parts and remodeling them in epoxy paste. Heads, legs, arms and torsos were cut into pieces and repositioned depending upon the activity I wanted to portray. (Sounds gruesome doesn’t it). After the figures were carved and painted with acrylics, I superglued and pinned them down, usually through the feet, into various positions. 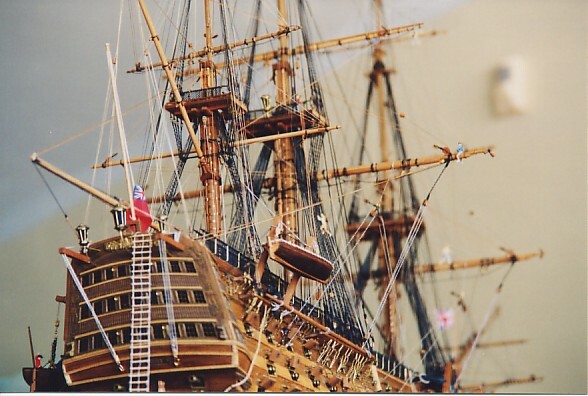 Painting the sailors was fairly easy because in the Royal Navy, at the time, there was no standard issue uniform. The differences in rank would be minor and not really noticeable at this scale. I really enjoy using figures for two reasons. 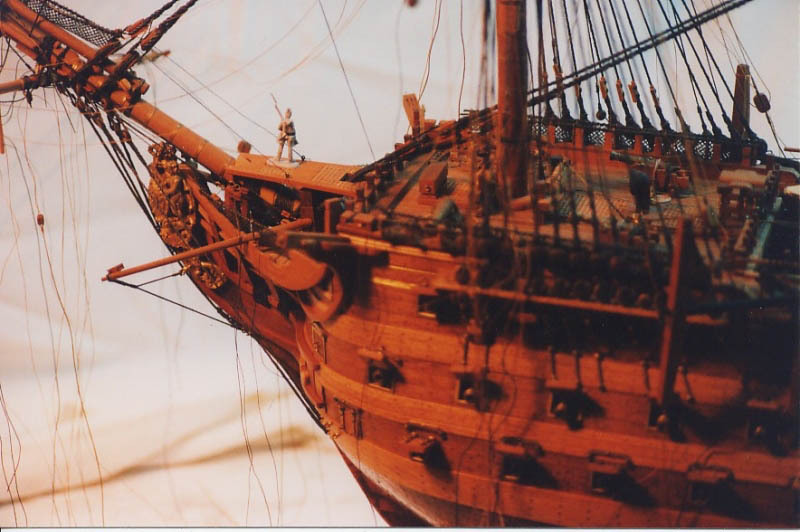 They give the viewer a sense of scale as to how big these ships really were and they also give life to the model both through their action and colour. 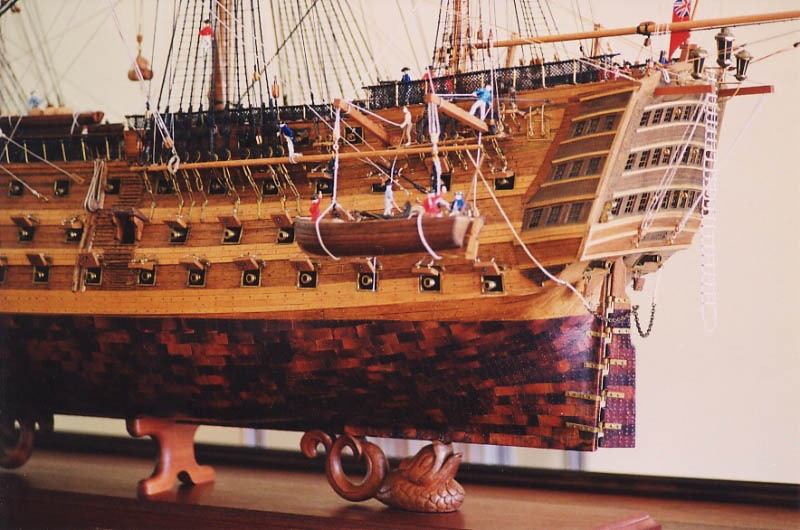 I prefer to employ various fine hardwoods rather than paint to simulate the ship’s colour scheme, as I know that wood develops a wonderful patina over time. The figures seem to add just enough colours to keep the overall effect from looking too drab. The model is now resting on its base of African cherry wood, which is attached to the case’s base of American walnut. The dolphins were hand carved out of American cherry. 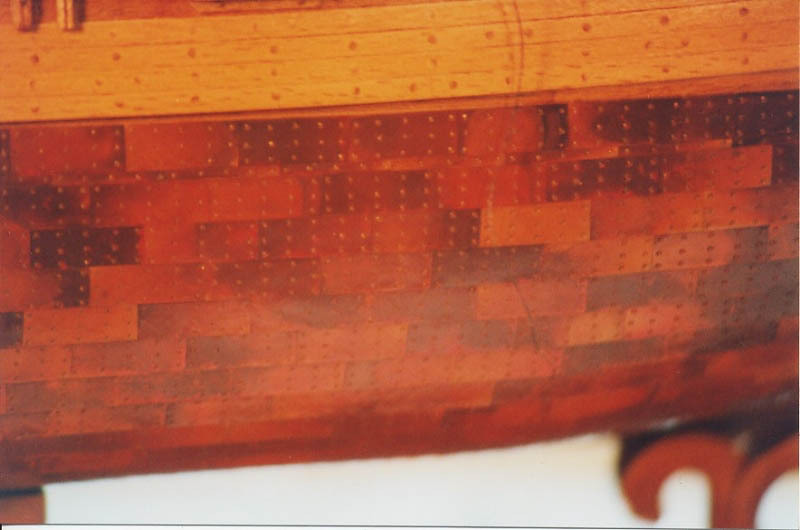 This combination of all three wood species reflects the colours in the ship’s hull. The Nelson statue I obtained many years ago. On the front of the base it reads “British Sailors’ Society”, and on its sides are written, “Presented by King E.R. VII” and “contains copper from Nelson’s ship Victory”. 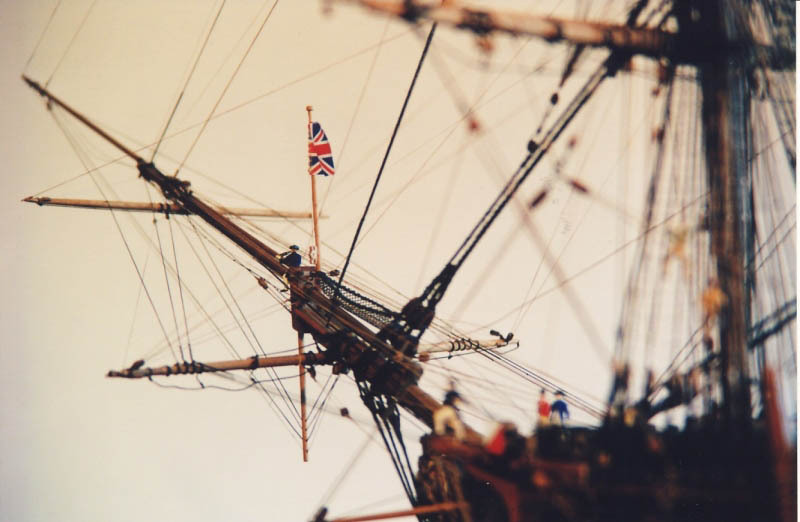 I wrote the British Sailors’ Society and they told me that they made a few busts of Nelson as presentation pieces, to commemorate the 100th Anniversary of Nelson’s death and the battle of Trafalgar. The copper that it contains was made from the original copper plates that were removed from Victory around this time. The busts are especially valued as they most surely contain copper that was present at Trafalgar. Model finished and in its case June 6th, 2000. Total hours 5500. My goal in making this Victory diorama was to appeal to the curiosity of the twelve-year-old kid in all of us (before the discovery of girls and fast cars). 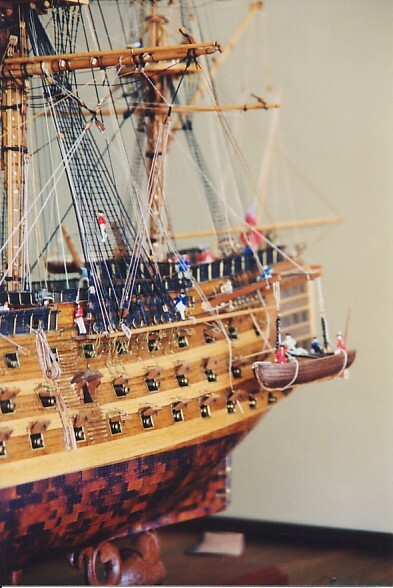 Personally, I prefer not to build admiralty type models, as I find the interest in them is usually limited to my fellow modelers or a few collectors. I have noticed over the years that, in general, people are mostly attracted to models that have human figures involved in telling a story. Although the Drumming Daybreak ceremony is the main storyline, there are many other mini stories going on here, sort of dioramas within a diorama. 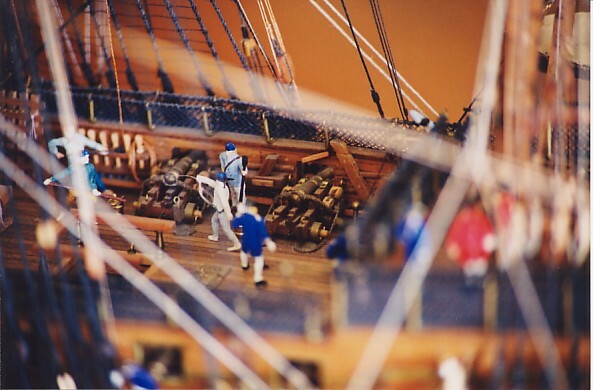 I also wanted to depict some aspects of daily life aboard a warship. My objective is to broadly educate and not necessarily to show things as they actually were. A good example of this is the two sailors hauling on the davit ropes to raise the boat. In reality, there would probably be twenty men on those ropes. 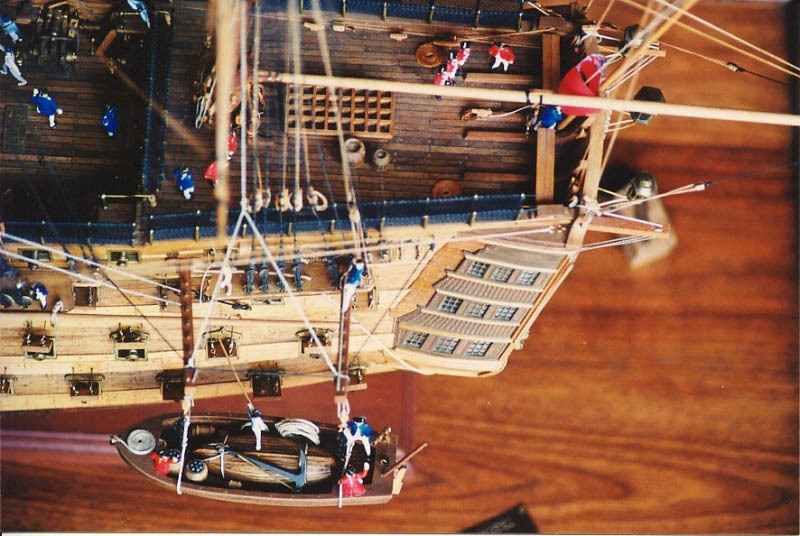 Another example is the two sailors par buckling the barrels up the rails on the hull (let’s hope they’re empty!). 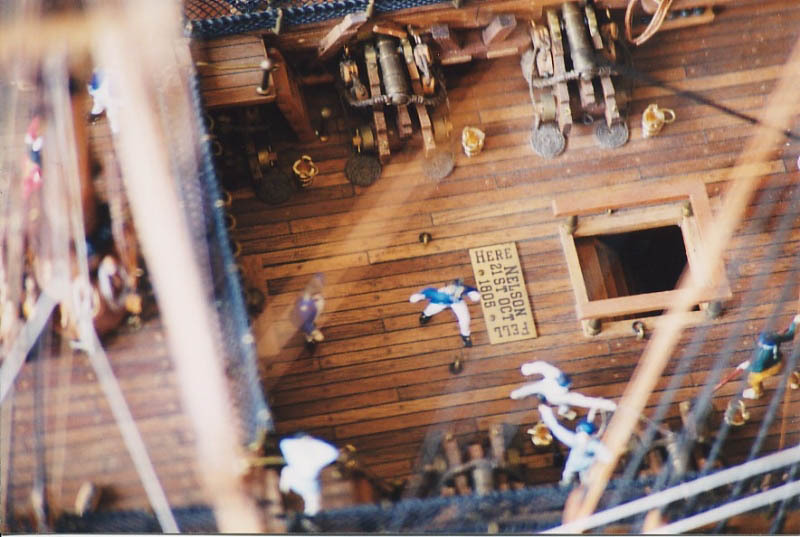 The most important factor in doing a good diorama, I believe, is to tell a story, to capture a moment in time, to take the viewer back to a different era, to hopefully raise an emotional response to what is being seen and thereby create a three dimensional work of art. In my work I am not a purist or a rivet counter, however, I do like to have lots of detail to keep it interesting. I try to be as accurate as I can but I will use artistic license for effect. 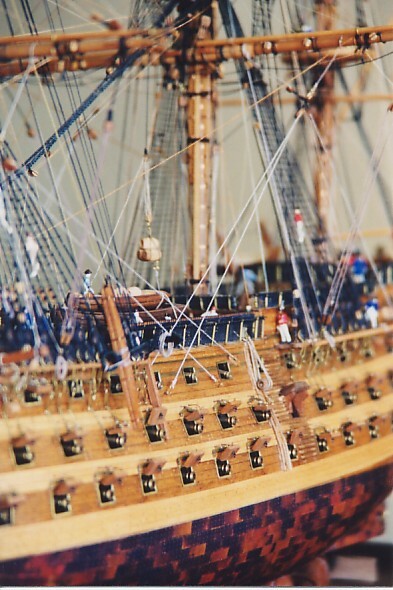 I spend a lot of time both before and during a project researching the ship and its history. I did not work on Victory continually over the twenty-five year period of her construction, as my other interests are woodcarving and building World War I aircraft dioramas. However, it was never long out of my mind. During the periods I was not actively building, I was doing research, pouring over pictures and plans, writing letters and daydreaming. I am a retired pilot and flight operations officer. I spent 28 years in aviation doing everything from sweeping hangar floors to flying instructor. In the 1960’s, I helped my father restore a full size 1929 Curtis-Wright Travelaire biplane D4D (CF-JLW) that now resides at the Reynolds Museum in Alberta. The last 17 years I spent in the visual arts, teaching woodcarving and making decorative birds of prey sculptures. I have been married to the same women for 40 years, as only she (Micheline) could put up with me and my hobbies. I presently have a Neiuport 28 – 1/16” diorama underway and am also working on a Wright Brothers Flyer. I hear through the grapevine that Model Airways has a 1/16” scale Jenny in mind. Hmmm! Now if I can only keep this 62 year old body in shape. 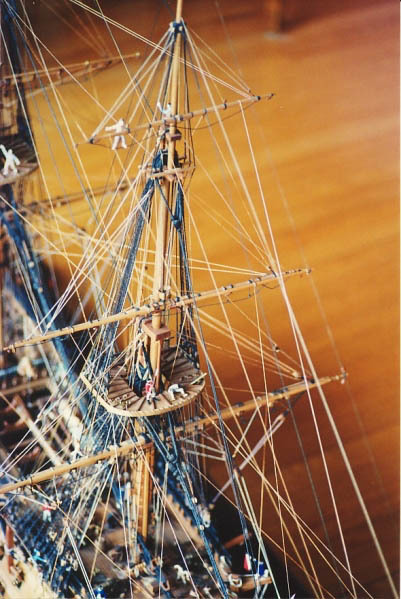 This model is dedicated to all those hard-bitten sailors of yesteryear who knew that, in the age of sail, the sea could only be truly loved from the land.